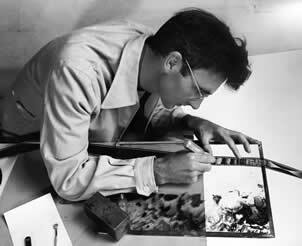 Norman McLaren was a 20th century filmmaker renowned for his innovation with non-traditional techniques of animation within his filmography, ranging from stop motion and pixilation as seen in 1952’s Neighbours to scratching images directly onto film such as in Begone Dull Care from 1949 and 1955’s Blinkity Blank (in which the soundtrack was also produced via the film). McLaren’s works share a reliance on audio in order to drive the visual aspect of his films. Born in Scotland in 1914, McLaren followed his father’s employment path initially whilst attending the Glasgow School of Art from 1932 to 1936, studying interior design. During his time there, he became interested in motion pictures, and especially experimental film, leading him to set up a production group for him and his fellow students. As he couldn’t afford a camera, he instead washed off the emulsion from an cinema’s discarded 35mm reel and painted directly onto each frame. Around 15 years later, McLaren employed this same technique in the production of Begone Dull Care. Begone features a musical soundtrack by the Oscar Peterson Trio. McLaren composed this music carefully with the musicians, as he wanted specific effects and moods to be created – hence the distinctive three sections within the score. The visual elements of Begone were created after the music had been produced, designed to give images to the music. The first section, with its upbeat jazzy style, is stylised with fast-paced movement of abstract shapes which sometimes resemble common items such as houses, people and fences (fig. 1). 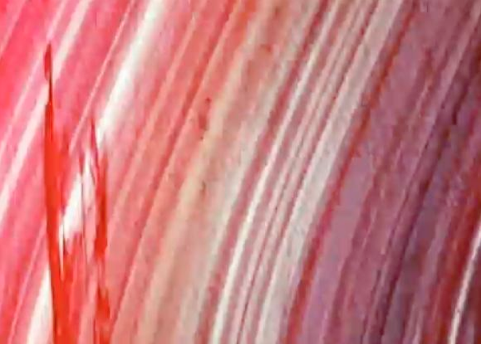 Each instrument is individualized within the video, and has its own characteristic effect – the cello solo, for example, imprints shapes upon a moving red background (fig. 2), the piano creates surreal shapes and lines which move in rhythm across the screen (fig. 3), and the drum solo creates discernible images for a split second (fig. 4). This fast movement is designed to work with the idea that the eye can see at around 1/20 of a second, meaning that certain individual frames will create an “afterimage” on the retina. The second movement is far slower than the previous, and uses different techniques to the first. 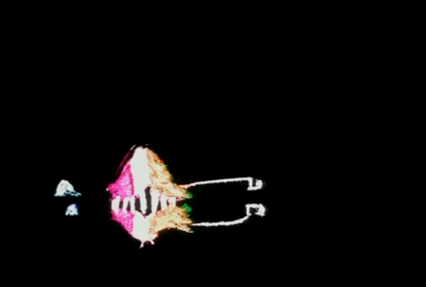 Instead of sudden cuts between different abstract ideas, the second movement contains lines and dots of white light “dancing” in time with the music across the black screen. With no discernible shapes or rhythm, it is far more open to interpretation than the other two movements, and it serves as respite from the two more fast-paced pieces. The third movement of Begone is again different, as the tempo of the music is increased, with the piano soloing over the top of an ominous-sounding cello. 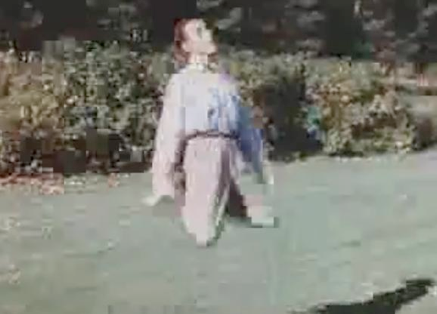 It contains sudden movements, increased speed and longer exposures to the same ideas, such as the piano refrain of two repeated notes for 9 seconds, “causing” the lines in the film to become shaky (fig. 5.1 and 5.2). As the music increases in intensity movement becomes more aggravated and a wider spectrum of colours appears, before the piano plays its outro and the credits flash up to these final few notes. McLaren wrote both his pre-credit and post-credit sequences to the music in the film, revealing his desire to use the music to “drive” the video – indeed, a review of Begone in the Music Educators Journal pointed to the “visual expressions” the images represent of the music, suggesting that the film is a reaction to the soundtrack. 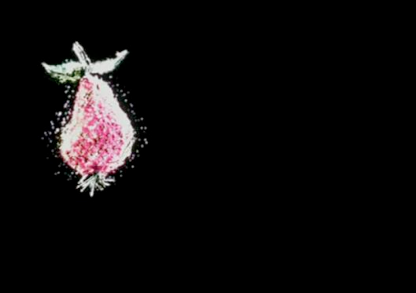 Blinkity Blank employs many of the same techniques as Begone; for instance the shapes drawn directly onto film (fig. 6) and the common household objects such as fruit and umbrellas (fig. 7). We also see a rough narrative involving a bird attempting to escape its cage. 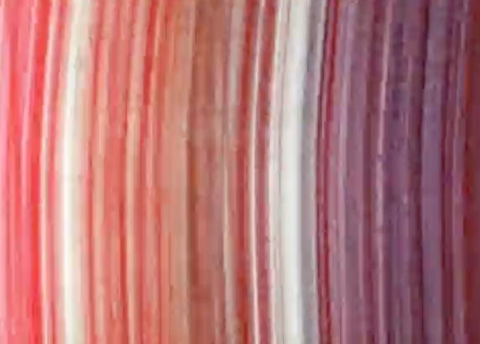 it appears to die in an explosion of colour (fig. 8), symbolised within the film though its floating around the screen ethereally backed by slow, melancholy music (fig. 9), before two oppositely coloured figures interact with one another, culminating in another explosion of colours as an egg hatches and gives birth to a new bird (fig. 10). Although without speech and clear, direct storyline, there is a definite interpretable moral outcome of the film, created through the shapes’ interaction with one another and the sound effects McLaren employs to create mood and feeling. As with Begone, Blinkity makes great use of sound; however, whereas Begone had a musical score with separate distinctive movements, Blinkity uses a combination of musical sequences and sound effects created by McLaren on the film to convey its message. 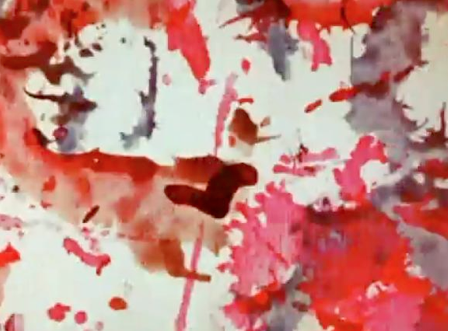 McLaren described how one note of his “animated sound” would require 50 individual lines on his 35mm film, and its pitch and intensity were adjustable through the shape and size of the strokes. A certain affinity comes through this method of sound creation as the film literally creates the sound, meaning that the audio is perfectly sculpted by and reacts to the images on-screen. Whilst this creates abstract sound, when combined with the musical score the audio is believable and perfectly reactionary to the video. Another of McLaren’s most celebrated films, Neighbours showcases a soundtrack created entirely synthetically, using the same methods as in Blinkity. 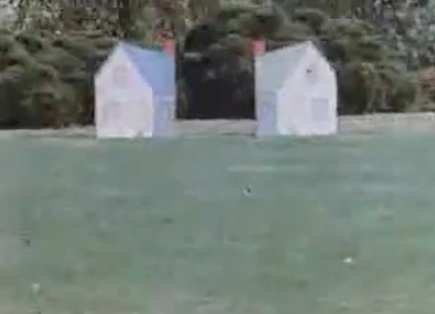 It also uses stop-motion technology, or pixilation, as cardboard houses slide into shot (fig. 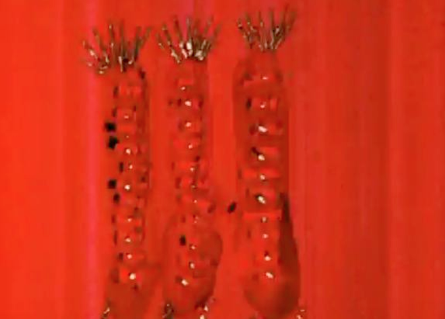 11), and then human figures within the film move unnaturally through the air (fig. 12). Of these three films, Neighbours has the clearest narrative, as its human characters react to one another over an animated flower whose beauty catches the attention of the two protagonists (fig. 13). 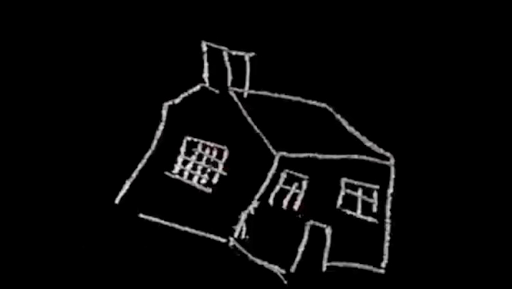 The comparative minimalism of the sound direction is therefore justified by its video representation. 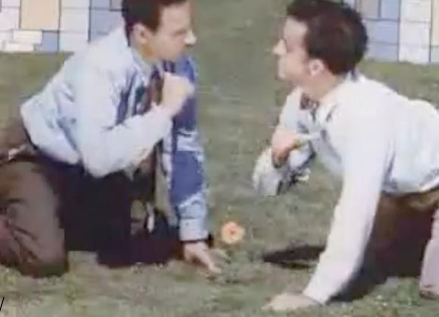 Whereas in Begone and Blinkity sound was used to drive the plot, McLaren’s “animated sound” in Neighbours is used sparingly to signify, for example, footsteps and punches thrown by the characters. Because of their creation on the film, the sounds are discordant and create an alienating vibe. As the film continues, each character destroys the other’s house, surreally killing their family in the process by throwing babies and kicking their wives off-screen (fig. 14). Although not as violent and shocking as if filmed at full-speed, it was still removed from the version which won an Academy Prize. With the death of the characters, the fence they had used to separate their houses comes alive and forms a barrier around their coffins (fig. 15), before the moral of the story is displayed in multiple languages to conclude (fig. 16). Neighbours’ human characters in a natural setting, clear narrative and artificial soundtrack make it the most accessible of these three of McLaren’s works; however, all three films create a clear affinity between abstract shapes and sound and their collaborative interpretation, whether artificially created, soundtracked by music, or a combination of the two. Begone Dull Care. Dir. 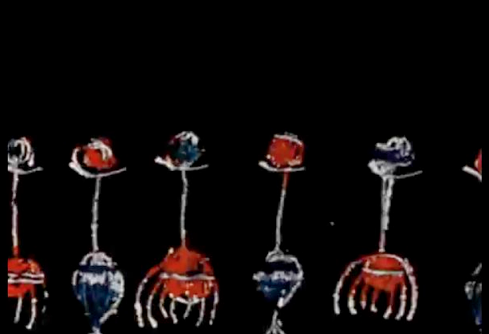 Norman McLaren. 1949. Blinkity Blink. Dir. Norman McLaren. 1955. Neighbours. Dir. Norman McLaren. 1952. This entry was posted in Animation, Course-related, Spectacular Attractions, Student Work and tagged Animation, Norman McLaren by Dan North. Bookmark the permalink.